Montessori preschool training from KHT Montessori is the best 3-6 Montessori training online if you ask me. And, since I LOVES me some I’ve a giveaway for you!!! I felt like Oprah there! You get a car and you get a car! Hmmm…that’d be nice. Anyways! 😉 Karen is starting a new session November 15th. Yep…it’s starting in like a week! How awesome is that?! You’ll have a chance to get your materials made and a good start on your Montessori training before your kiddo starts a new school year. It’s kinda funny cause years ago when I took her class I started in the fall too. Matter of fact…I think it was the November session I started in. I did the fast track because Bub had just been diagnosed and the only thing that kept replaying was how Montessori was so sensory rich and really followed the needs of the child. I also loved that I didn’t need to spend a bajillion dollars on materials. She showed us ways to save money if we couldn’t afford the pink tower or the bells or the math beads…all while staying true to the Montessori pedagogy. I actually became certified with NAMC and I felt they didn’t teach anything I didn’t already know or couldn’t look up on the internet. I did love their cd of printables and black lines. Those were great. But …a few printables do NOT a Montessorian make. Learning the whys and hows and how it all connects and even how to look forward and see where my kiddos will be next was really helpful and Karen taught that. I also loved that I didn’t need to spend a bajillion dollars on materials. She showed us ways to save money if we couldn’t afford the pink tower or the bells or the math beads. Now, don’t get me wrong…she taught us HOW to use those materials but honestly…cuisinaire rods will teach your kiddo the same thing as the math beads. I know…I know…don’t holler at me but sometimes a kid can actually learn how to fold a napkin without special napkins in the learning room. You simply need to use or start using napkins at the table! 😉 Same as Grace & Courtesy…you don’t need special equipment..you can simply start using your manners! We even discussed Montessori potty training ways within the forums which helped to bring Montessori into the home AND classroom. I’ve NOTHING but high regard for the quality and the amazingly affordable price. A friend once said nothing can be obtained cheap, fast, and it be of quality. I don’t think she ever checked out Karen’s Montessori albums. Luckily…you can check ’em out AND you can win a seat in her next class which starts next week by entering below. Good luck and come back by daily as you can enter multiple ways every day. UPDATE: Monica P. is on her way to becoming a certified Montessori teacher with KHT Montessori! Congratulations Monica! I hope you find as much joy and help with Karen’s course I have! « “Keurig My K Cup” and win a Keurig B40. Hi Sarah! Monica P. won the online Montessori training! 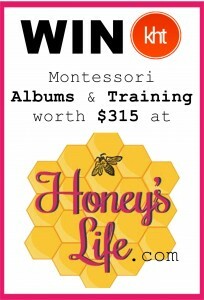 So happy that Honey had a Giveaway for KHT Montessori. I’m Karen and the new course started today and I invite you come to http://www.khtmontessori.com and enroll! The new classroom is wonderful and easy to use. The manuals come with the course and so does having me to answer any questions and concerns you might have for 12 MONTHS! I would love to answer any questions at karen@khtmontessori.com! Thanks Honey! You are fantastic! I just love the philosophy of Montessori and how we should perceive children. Makes so much sense! I couldn’t agree more with you Melissa! What an amazing giveaway! Have been trying to explain Montessori to my husband — such a wonderful principle. I love that it allows my children to follow their passions. Yes! It enables children to spend the perfect amount of time on a project! I think that’s another one of the amazing things about Montessori. I know I hated having to change subjects JUST when I knew I was starting to get it as a child. Good luck with your new school and on the giveaway! I love that Montessori is very hands on and concrete ideas my daughter really grasps! I am very new to Montessori, however I love that it is so creative. No boring worksheets here! Real life learning, the way it should be. Thank you for this opportunity! No worksheets is what I believe too!! I always think of them as busy work! I’ve found a way though to Montessori them up so they’re actually useful if you ask me! 😉 Good luck Sarah! Montessori has truly been a blessing in our lives. I have a little one who is very bright, but has a language delay and coordination issues (she struggles with handwriting…). She along with her two younger sisters are being homeschooled and while it’s adjustment, we’re finding our way and enjoying the journey. We’re currently working on the continents and just did a lesson where the kids used beads (orange for North America, white for Antartica, etc.) to fill in each continent. We will later use blue beads to fill in the water area. Sorry, I got carried away, but this lesson is going so well, I just had to share. We print a lot of our materials, including our blank maps from (the helpful garden Montessori). I look forward to exploring your blog. That reminds me of a continent activity I did with the kids when they were little! I should do it with Sunshine! I hate how I forget “stuff” or think we’ve done it with all but it was only done with the older two! 🙂 My oldest struggles with handwriting too. I’ve found it’s easier for him to write in cursive rather than print as it’s harder. Many OT recommended cursive over print too. Try that. My girls prefer it as it’s “prettier” so maybe that’ll help to get her interested if she isn’t. The sensory works will really help her so much! If she’s struggling with writing…move to a different activity and work on her fine motor skills in other ways. Believe it or not…Legos are awesome. He’d start decompressing and yet he’s STILL building those skills. Bead placing, stringing beads…all that. She may also be ambidextrous. I am. As a kid they refused to let me write left handed. While I now write right handed, I sweep, shovel, and swing a bat left handed. (Bat swinging skills are better right handed though as we were taught righty there too.) Hope this helps! Oh…have you done any writing in the sand? That was always fun. They also loved writing in pudding for messy play! I love Montessori, one reason being for the intrinsic motivation it inspires. I also love aspects of Waldorf. I have been talking for some time about my dream school where more than one principal is adopted! So pleased to have found you! I actually created a word… “Mondorfment….when Montessori, Waldorf and Attachment Parenting meet” It’s actually where I was before I rebranded. We use LOTS of Waldorf principals here. I believe the’re sides of the same coin and allow each child to reach their full potential. 🙂 Glad you’re here! I would love to win this. I am hoping to start homeschooling in the fall and this would be a great addition to my teaching knowledge! I love how Montessori is child-led and directed. I love the sense of simplicity and order. Yes! There’s a busy yet calm feeling to a Montessori learning room. It makes me think of a bees’ hive. Everyone working with a purpose and busy, busy, busy, yet…there’s peace and calm and grace. So excited to learn more! I love seeing my children apply Montessori into everyday living. I always like seeing how people are surprised that little ones (2 & 3) can do and take care of so much. My father struggled with it especially and would try to do for Sunshine. She finally set him straight one day and in a very firm and irritated voice said, “NO. I can do it!” Montessori isn’t for a classroom…it’s for your day, your life. After all…a Montessori classroom is a mimic of the real life we are guiding our children through. I am getting really excited to homeschool and have truly been drawn to montessori. I am REALLY nervous to begin since I didn’t attend a montessori school and don’t feel like I am ready yet. I could really use some intense training. I LOVE that montessori is so visual and child lead. It seems like all schooling should be this way….just common sense! Real, hands on learning, that’s my favorite thing! I love that with Montessori my children are learning in real life, hands on, using all of their senses. It’s so neat to sit back and watch the gears turning in their heads while they do an activity. I’m pretty new to Montessori, but that’s what I have found/love so far.